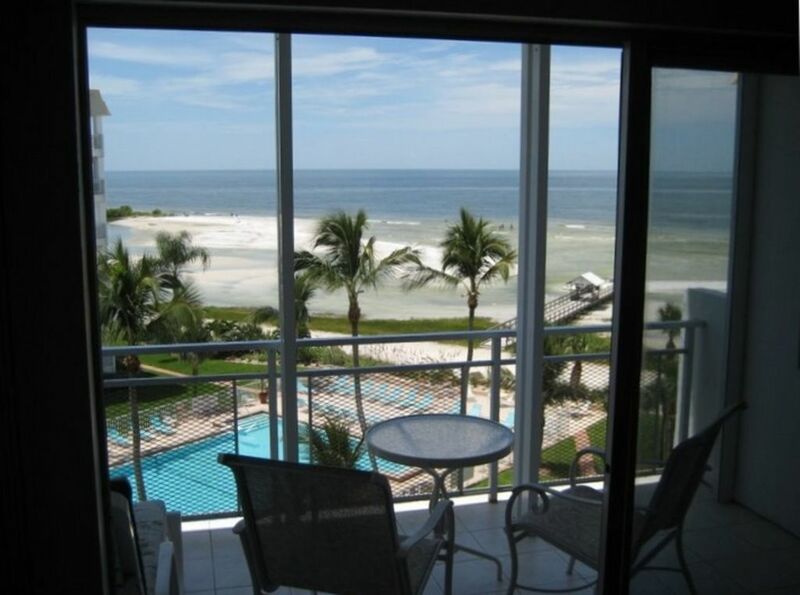 Enjoy your Florida vacation in this tastefully decorated, Florida-motif, two bedroom condominium with a gulf and pool views. It is only 24 feet in from the direct-front corner location as it views the Gulf and pool in two directions. Carpeting, furniture, and appliances make this condominium most desirable. Enjoy the fifth-floor shaded balcony overlooking the shimmering pool or simply relax and watch a spectacular sunsets over the Gulf of Mexico. If you are in the mood to walk or jog, there are seven miles of beach where you will find shelling to be outstanding. Nestled within view of a natural wildlife preserve, looking out over the aquamarine waters and white sugar sands of the Gulf of Mexico, this charming condominium vacation is truly paradise. The master bedroom has a king-size bed, a full private bath, linen and walk-in closets. The kitchen is fully equipped with all appliances including the dishwasher, range, microwave, and refrigerator. The living room comes equipped with a sleeper sofa, large TV and VCR. The attached dining room is accented beautiful decor. Across from the condominium there is a marina where you can rent a boat and explore miles of coastal backwaters, a manicured golf course, shopping center with a charming open-air trolley to take you anywhere from the tip of Fort Myers Beach past the pier south to Bonita Springs. Plenty of fine and casual dining is available. As you look over the pool in view of a natural preserve and the island's only "double beach," the incredible grounds, sparkling gulf-front pool, aquamarine waters, white sands, and breathtaking sunset views of the Gulf of Mexico will make this wonderful condominium vacation one not to miss. We have three direct gulf-front and pool view condominiums in this same complex called Gulf Side Sunsets II, III, and IV. This unit, Gulf Side Sunsets IV, is just two condominiums down the hallway from Gulf Side Sunsets III. It is directly across the pool from Gulf Side Sunsets II. We also have an all seasons, all sports northern Michigan lakefront three bedroom chalet with 20' vaulted ceilings and fireplace overlooking crystal clear Hubbard Lake (28 square miles of watersports, fishing and fun). Invite family or a group of friends to go south or north to join the fun in any of our four vacation getaways!